I wrote a silly piece of Wold Newton/Baker Street Irregular "scholarship" called "The Kents and the Clarks", following two---ah---unusual family trees. I'm very unexcited by the idea of Jim Carrey as THE GRINCH WHO STOLE CHRISTMAS. Despite my faith in Ron Howard as a filmmaker and Jim Carrey as a living cartoon character, I don't think it will approach anywhere near as close to the original Dr. Seuss idea as Chuck Jones' wonderful half-hour cartoon, narrated by Boris Karloff. How would you make that to a two-hour movie without padding it like mad? Sorry. No interest. 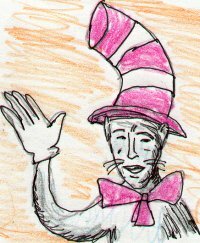 Now I read that Tim Allen wants to do the CAT IN THE HAT. That he was scared of the story as a child, and wants to do a mildly scary story where the adult human slowly turns into the mischevious feline babysitter---sort of like a werewolf. He wants it to have an "edge". THE CAT IN THE HAT?? Every kid can make a mess. That's the part you empathize with, in THE CAT IN THE HAT. Van Kilmer as CURIOUS GEORGE? Some things really do work better as cartoons. I can't believe with the thousands of would-be screenwriters waiting to break into Hollywood, the best ideas they can find for a movie is a remake of THE GRINCH STOLE CHRISTMAS. I really can't. OTOH, I'm really looking forward to the new DUNE miniseries, with John Hurt as Duke Leto. What I've seen of the trailer/ads of it looks really promising. I want to see new things never adapted to the screen before. I don't want to see a remake. I don't even want to see the cute booties of CHARLIE'S ANGELS kick other people's booties. I want someone to make RINGWORLD. (It would cost a fortune in special effects, but that's the point...) Or MORE THAN HUMAN. Or ODD JOHN. Or SIRIUS. THE MANICHORE. THE GLASS BEAD GAME. THE LESSER TRUMPS. I'd like to see more of John Dickson Carr's Dr. Fell stories adapted to movies. The best movies start with a book, that starts with a single vision, rather than a group production. Instead, the world continues to deteriorate. Item: the Olsen twins, Mary-Kate and Ashley, are teenagers, or 'tweens, or something, looking rather like Brittley Spears before she, ummm, "bloomed". In a few years, will they be doing bestselling videos and be on every radio station. one year ago today : BREAKING AND REPAIRING .